What takes an actor from man to meme? Artist to icon? Character to cult figure? It’s a phenomenon that’s befuddled even the brightest minds in entertainment, one that’s elevated entertainers to a strange, mythic place that makes them larger than life. There is no better example of said mystery than Jeff Goldblum, the miraculously six-foot-four, 65-year-old silver fox who’s been gracing us with his presence for the last 40+ years. Effortlessly stylish, totally eccentric, and disarmingly charming, Goldblum has inspired a recent oral history, tattoos, memes, and all of us to live our best lives. So what is it about Jeff Goldblum that’s allowed him to work consistently for all these years and smooth-talk his way into our hearts (and elsewhere)? It may be an unsolvable enigma, but I have a few ideas. Can you remember the first time you ever saw Jeff Goldblum? For many of us (particularly in my age group), it was Jurassic Park. Who could forget Dr. Ian Malcolm, lover of chaos, women, and stylish tinted specs? There are two kinds of people in this world: those who crush on Alan Grant, and those who lust after Ian Malcolm. Like much of Goldblum’s career, his turn as Malcolm has been memed to oblivion (I will admit that this remix was once my ringtone) – even by Goldblum himself. For those who had followed Goldblum pre-Malcolm, they’d become familiar with the gangly, mop-headed fellow in flicks like The Big Chill, Earth Girls Are Easy, or The Fly. He could go from charismatic chaos theorist to believable tech expert at the drop of a hat, and he even managed to elevate his worst movies to a watchable place. After Jurassic Park, I happily devoured Independence Day, which became second on the list of the most rewatched movies in my house (and I’m sure many others). I didn’t see The Big Chill until later, but when I did, boy, did I feel things. Across generations, Jeff Goldblum’s been a part of some of our most formative films, blockbusters that hold up and cult classics that draw in new fans every year. It’s no wonder he’s made such an impression – he was (and still is) literally everywhere. Goldblum’s constant presence in our favorite films would have been one thing, but the apparent real-life charisma he boasts helped push him into an entirely different realm of celebrity, one that’s seen him manifest an elusive, flirtatious fantasy of a gentleman, one who might humor you with a few filthy jokes and a wink and a smile. Even if you ran up to him in 2017 and quoted The Lost World, he’d likely beckon you with open arms. Jeff Goldblum isn’t one to spit on his body of work; as some stars distance themselves from their most iconic roles and sigh despondently when their best-known lines are quoted back to them, Goldblum seems to graciously embrace what got him to where he is today and hold these roles near and dear to his heart. He isn’t just a kooky character or performer-for-hire – this is a guy who loves what he does, and loves you for loving what he does. Discovering he’s just as wonderful in the real world only adds more allure to the ever-enigmatic Goldblum – and that’s without mentioning his total self-awareness when it comes his legendary status. As he’s aged (like a fine wine, might I add, which has only further fueled the obsession) and become privy to the internet’s obsession with him, Goldblum has seemingly leaned into this perceived persona. He pops up at food trucks to serve sausages, searches the tag #JeffGoldblum on Instagram, plays with a jazz band every week in Los Angeles and delightedly mingles with his fans. 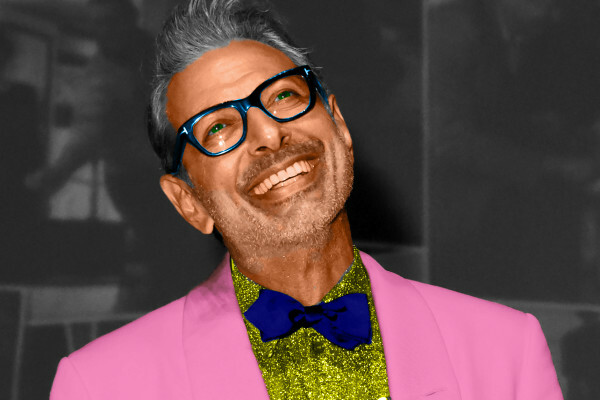 He laughs at Goldblum memes and dresses just as snazzily as you’d dream he would. There’s a sultry smoothness to his voice, a sensual quality to his being that makes him ethereal in his own bizarre way. There are other cult figures, sure, but how many live up to the hype? The surreal, infectious electricity of Jeff Goldblum is unmatched by any other in Hollywood, and from the moment he appeared for a mere few seconds in Annie Hall and declared “I forgot my mantra”, we knew ours: “Jeff Goldblum.” No other comments or adjectives necessary.